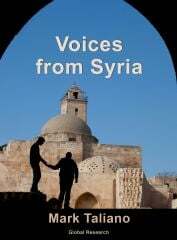 The following article is by Janice Kortkamp, a honest and courageous American citizen who visited Syria on several occasions. I was offered the opportunity to interview this man and was thankful for it because this gets into the very heart of the conflict here. The “moderate rebels”, the “freedom fighters” … those armed groups that have been directly supported by my government. It is ironic perhaps that the group this guy was in is Ahrar al Sham (an Al Qaeda affiliated group). On my first trip in May 2016, I was heading from a village near Homs to the city. The road at that time was quite dangerous and ‘hot’ because the whole plain from the hills where I’d been to Homs was scattered with ISIS, al Qaeda and many other groups who controlled different villages in the area. We passed right by a power station on the road and just beyond it is/was an Alawite village called al Zara that was pointed out to me. That morning the people of al Zara were going about a typical day. I remember I waved towards it and said “hello al Zara” for some reason. On another trip, while in Aleppo, was scheduled to go to a refugee center to meet with people coming from eastern Aleppo. The day before we went, Ahrar al Sham and al Nusra bombed buses of Shiite villagers leaving the terrorist-beseiged villages of Kefraya and Foua in Idlib as a prisoner swap deal. 5,000 people were being transported but as a final gesture by the “rebel” terrorists who love “freedom and democracy” they arranged bombs to target some of the buses. They killed over 100 – mostly children. The survivors were brought to the refugee center we were visiting and we got to speak to them. Vanessa Beeley was also there and did important interviews and articles about it. So all that to say, I personally know something of the character of the group Ahrar al Sham. Again, it’s a group directly supported by the US, Saudi Arabia, Qatar and Turkey as “moderates” who received money, weapons including advanced weaponry, intelligence support, etc. The US has refused throughout the war to designate it as a terrorist group. He has five children and is from al Waer unlike many of the fighters who were in that suburb who came from all over Syria and some from other countries. As we approached him he was busy welding some decorations onto a door. No eye protection and smoking, he seemed content and even jovial, very willing to talk though somewhat manic. We went into a room next door and began. Adnan is walking free in al Waer because he accepted reconciliation from the government. As Homs city was being liberated from the many armed groups that had terrorized it for years, fighters moved into al Waer and it became a stronghold that was not fully liberated until 2017 – not entirely via military victory but through this process called “reconciliation”. Basically the offer was that fighters willing to lay down their arms and re-enter civil society or fight for the Syrian Army could do so. Or they could take their families and personal possessions including rifles to Idlib or Jarablus. Most civilians chose to stay and some of the fighters like Adnan as well. 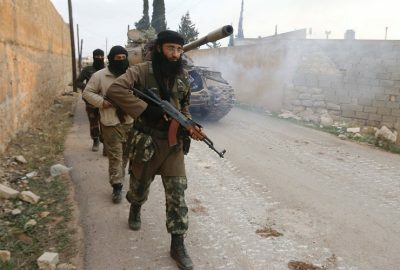 Idlib in particular is now populated by tens of thousands of fighters and their families who refused to stop fighting against the government. Many were misled by the terrorist leaders into thinking they would be killed by the Syrian Army if they stayed. Nothing of the sort happened of course which I’ll elaborate on in a future post. According to all the first hand testimonies I’ve heard, including those in al Waer, as armed groups took over areas the civilized society of Syria was replaced with their violence and rule by sharia law. Minorities were driven out or executed. You might ask how any rational person would choose to stay in such situations like the civilians who have stayed in terrorist held areas. How to try to explain this in ways Americans can understand? This is the best I can come up with: imagine you’re a white American and the white supremacist movement has gained momentum thanks to external support from other countries who want to destroy America. These other countries use non stop propaganda to fuel fears among whites that the government and minority groups want all the whites dead. Those other countries bring in massive numbers of weapons and huge stacks of cash to white supremacist leaders and fanatics over the borders of Canada and Mexico. Many whites buy into the whole charade out of fear or feelings of hatred towards minorities. Getting sucked into the mob mentality they begin to view their minority neighbors, even former friends, with distrust and prejudice. The groups take over key cities and ‘purify’ them of minorities. Most whites in the US see this is happening and resist it all but others accept it and stay in their cities and just survive through it because while they don’t like the way the white supremacists are treating them they at least can live and work. Yes, similar to the Nazi ideology. Replace Sunni supremacists with white supremacists and you get the idea of what happened here. Whether political, racist or religious, extremism leads to violence and chaos. It is absolutely essential to understand that most Sunnis in Syria do NOT support this ideology or these “rebel” terrorists. Although Sunnis are the great majority here only a minority of them went against their government. In fact the majority of the army and government are Sunnis as is President Assad’s wife, the First Lady Asma. So back again to Adnan. As the groups took over al Waer they got men and youths to join them using many different means. First, the family of any man or son that joined the cause was well treated. They got food for example and medical care. Families whose fathers and sons did not fight went starving and were persecuted. This was the motivation of Adnan according to him. Is he telling the truth? Only God knows. Others were lured by the high pay offered thanks to the deep pockets of the Persian Gulf states particularly Saudi Arabia and Qatar. Fighters for “rebel” groups typically were paid ten times what soldiers in the Syrian Army are paid. They also got perks like women and drugs, especially captagon, which I describe as like crystal meth. It makes you oblivious to pain, fear and fatigue for days. Also makes you crazy. Of course there are those who are truly brainwashed and support the idea of Syria becoming a religious fundamentalist sharia law based state. This is anathema to the great majority of Syrians of all faiths and backgrounds. The harmony and mutual respect among religious groups, the empowerment of women, the personal freedoms and safety here are precious and protected. The brainwashed ones teach their children to hate and kill as they do. In fact, “rebel” terrorist groups used even children as snipers, fighters and suicide bombers. One sniper was only nine years old in eastern Aleppo. Of course the western governments and media never talk of this or the constant atrocities of their pet “rebels”. They don’t care about the children being raised up to be the next generation of ISIS and al Qaeda. So whatever his reason truly was, Adnan became a sniper for Ahrar al Sham, one of strongest of many groups in al Waer. He and others like him were stationed in the high rises of the neighborhood. From their vantage points they could shoot people on the streets or soldiers far outside the area to instill terror in the people of Homs. On the edge of al Waer is the busy road from Homs to Tartous. Most people in Syria travel on buses both large and small from place to place. The terrorists in al Waer had checkpoints set up on the road in addition to the snipers. They would stop the buses. Alawites, Christians and Shiites would be separated. Many were executed outright; others were kidnapped and held for ransom. If the ransom was not paid the victims would often be chopped into pieces and laid out on busy streets as a warning of what would happen if demands weren’t met. These kinds of crimes were literally 100% non existent in Syria before Obama and Hillary and McCain and Graham and Rubio etc started arming and supporting the terrorist “freedom fighters”. Syria was the 5th safest country in the world according to Gallup polls. I asked Adnan about foreign fighters, particularly commanders. He said the commanders were always behind the scenes and the regular fighters never dealt with them, only their local lieutenants. Every fighter was given a new name – they and the commanders never used their real names. Another question I had was this … many fighters and their supporters claim this ‘revolution’ was against the government because they were not allowed to criticize the President/government and they were fighting for that freedom. In my personal experience talking with Syrians many seem quite open and express serious concerns about many issues actually but it is well known that security is tight here. Over the war people have learned how deadly Syria’s enemies are and this explains some of why this is so. Also Syria before Hafez al Assad had suffered through many coups (usually assisted by outside governments like the US) that destabilized the country. Anyway, that’s a topic for another article. My question to Adnan was – while people living under the rule of the armed groups were able to criticize President Assad all day long and cheered on doing it, were they allowed to criticize their “rebel” rulers? Of course not was the answer. Severe punishment, even execution were the penalties for such crimes. Adnan, for all his wild eyed, semi-manic mannerisms struck me as pragmatic, not fanatical. I deliberately held out my hand to shake his to see if he would touch a woman and he did without hesitation. Perhaps he really does want to just move on or maybe he is a crouching tiger, a ticking time bomb; I can’t judge that. At the end I asked him what his advice was to the “rebels” holding Idlib. His response, if I’m understanding it correctly, was “the train will keep moving but dogs stay behind” by which I think he meant that their defeat is inevitable but many will stubbornly keep fighting out of spite and stupidity. Adnan, while I’m sure he is being closely observed, is free now to decide his future – unlike the innocent Syrians he killed. The reconciliation program is highly controversial. Many Syrians will never forgive or trust those who took up arms against their country and their neighbors. Others see it as a successful strategy for ending the violence in many areas. Only time will tell. This is something for Syrians alone to debate and decide. The pain and suffering are theirs alone. Their future is too.